There has been widespread condemnation of the Turkish authorities following the arrests yesterday of two journalists and a human rights activist who had supported a campaign of solidarity with the pro-Kurdish newspaper Özgür Gündem. An Istanbul court ordered the pre-trial detention of Paris-based Reporters Without Borders (RSF) Turkey representative Erol Önderoğlu, Human Rights Foundation of Turkey chief Professor Şebnem Korur Fincancı, and journalist Ahmet Nesin, on charges of “making terror propaganda” when they served as the editors-in-chief of Özgür Gündem for one day as a part of the daily’s “Editor-in-chief on Duty” campaign. The European and International Federations of Journalists (EFJ-IFJ) condemned the arrest, calling it “unacceptable” and urging the government to immediately release the journalists. “Showing solidarity by working as journalist or editor-in-chief cannot be considered terror propaganda. The Turkish authorities are clearly misusing the legislation to silence critics and human rights defenders. Those people arrested must immediately be released. Turkey is working against itself by jailing press freedom activitists,” said EFJ President Mogens Blicher Bjerregard. The Organisation for Security and Cooperation in Europe said it was “appalled” by the arrests, which it called a “most severe blow to freedom of expression and media freedom in Turkey”. European Union foreign policy chief Federica Mogherini and Enlargement Commissioner Johannes Hahn said the court decision “goes against Turkey’s commitment to respect fundamental rights, including freedom of media”. Reporters Without Borders said of the the detention of its representative: “Erol Önderoglu has fought tirelessly to defend persecuted journalists for the past 20 years. He is a leader in this field because of his honesty and integrity, which are recognized all over the world. Handcuffed and jailed after a closed hearing, Erol Önderoglu is today the victim of the persecutions he always denounced. It’s now our turn to fight for him. 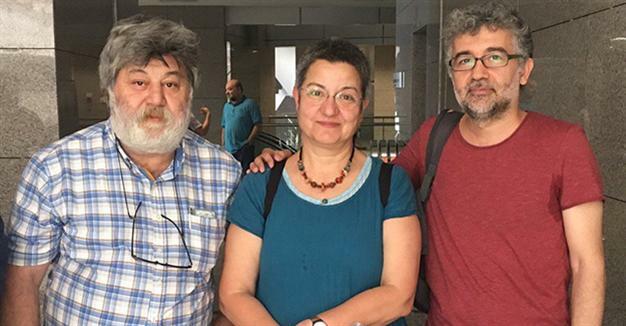 “We call on the Turkish authorities to immediately and unconditionally release Erol Önderoglu, Ahmet Nesin and Sebnem Korur Fincanci. All charges brought against them and 34 other participants in the solidarity campaign with Özgür Gündem should immediately be dropped”. A total of 44 prominent journalists in Turkey served as one-day editors-in-chief during the campaign. Some 37 of them have been investigated up to now. RSF ranks Turkey 149th out of 180 countries in its latest World Press Freedom Index for 2015. About 100 people rallied at the Istanbul courthouse to support the three, chanting, “We will not bow to pressure”. The arrests are seen by many as another step by the state to try and prevent solidarity with the embattled Kurds by journalists, human rights activists and others across Turkey. It is also seen as part of President Erdogan’s campaign to silence criticism as he seeks to formally establish for himself executive presidential powers. Parallel with this Erdogan has sought to discourage potentially damaging media exposure. Last month two prominent journalists at the Cumhuriyet newspaper were jailed for at least five years for revealing details of the Turkish secret service’s arming of jihadist forces in Turkey. President Erdogan was named as a complainant in that case. In a separate development this morning Hurriyet newspaper said its New York correspondent, Razi Canikligil, was detained on his arrival at Istanbul’s Ataturk Airport. Canikligil has reported on the U.S. prosecution of Turkish-Iranian businessman Reza Zarrab on charges that he helped Iran evade American sanctions and buy oil and gas in exchange for gold. Zarrab has been accused of bribing senior Justice and Development Party (AKP) ministers but was praised by President Erdogan as a “philanthropist” whose work had “contributed to the country”.